HAMBURG, Germany – Kirsten Sweetland accomplished the unthinkable on Saturday winning her first career bronze medal on the ultimate stage at the World Triathlon Series in Hamburg, Germany. With her career in jeopardy after battling a series of injuries over the last six years, Sweetland demonstrated her fitness and resiliency by climbing onto the World Triathlon Series podium for the first time in a fast and furious sprint race at one of the largest triathlons in the world in Hamburg. After a solid 750-metre swim, Victoria’s Sweetland did most of the work on the 20-kilometre bike before pulling away from the field with a handful of the best women triathletes on the planet for the five-kilometre run where the 25 year old led a group of five heading into the bell lap. As the number-one ranked triathlete in the world, Gwen Jorgensen of the United States, bolted into the lead, Sweetland and Australia’s Emma Jackson sparred with each other over the final two kilometres while running shoulder-to-shoulder for the final two spots on the podium in front of a huge German crowd. In a sprint to the wire, Jackson edged out the young Canuck in a photo finish for the silver with a time of 57:00. Sweetland also finished at 57:00. “I had been doing some good training in Spain with my friend Emma Moffat, but you never know where you are really at until you get out here,” said Sweetland, who will represent Canada at the Commonwealth Games in 10 days. One of the top cyclists in the triathlon world, limited run training due to injuries have prevented the comeback kid from kicking it into high gear on the run and getting to that next step. That all changed on Saturday. “After the bike today I just kept going. It feels amazing to be able to run with the big girls,” added Sweetland. Jorgensen meanwhile ran her way into the history books, becoming the first woman to win four straight World Triathlon Series races after posting a time of 56:54. 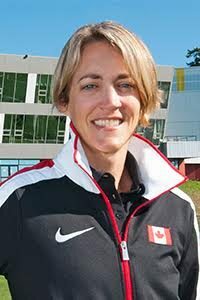 Canada’s Paula Findlay held the previous record, winning three WTS races in a row in 2011. Lost in the thrilling bronze-medal break though for the Canadians was another solid outing by Quebec City’s Sarah-Anne Brault. The 24 year old, who was fourth in Auckland this year, battled her way up the standings on the bike and run course where she finished 11th at 57:47. Calgary’s Ellen Pennock rounded out the Canadian contingent, placing 37th at 59:50. Once touted as Canada’s next great triathlete after building a resume that includes two victories, along with a silver and bronze medal on the World Cup circuit in addition to becoming the first Canadian woman ever to win a medal at the Junior World Championships in 2006, Sweetland’s career has been plagued with a series of heartache after missing two Olympic Games teams, and battling countless injuries and illnesses that have left her pondering her athletic future. But the gutsy and courageous Canadian remained committed to a long and rollercoaster journey back to elite racing that began with a silver medal at the 2010 Under-23 World Championships in Budapest, Hungary. Battered and knocked down, the feisty fly weight continued to pick herself up and battle back. Over the last two seasons, she has shown steady progress with a handful of top-10 finishes. Her previous best WTS result came one year ago on the toughest triathlon course in the world in Kitzbuhel, AUT when she was sixth. In the men’s race Andrew Yorke was the lone Canadian to suit up and finished 31st at 53:10. Alistair Brownlee, of Great Britain, found his way back onto the top of the podium for the first time this year winning with a time of 51:43. Vincent Luis, of France, was second at 51:45. The younger Brownlee brother, Jonathan, clocked-in at 51:48 for the bronze. The World Triathlon Series continues on Sunday in Hamburg with the Mixed Relay World Championships. Triathlon Canada is the governing body for triathlon in the country. Recognized as an Olympic medal sport since 2000 and Paralympic medal sport as of 2016, Triathlon Canada’s mandate is to promote, foster, organize and develop the sport of triathlon, and its related disciplines, in Canada. For more information on Triathlon Canada, please visit us at www.triathloncanada.com on the Internet. 1. Gwen Jorgensen, USA, 56:54; 2. Emma Jackson, AUS, 57:00; 3. Kirsten Sweetland, Victoria, CAN, 57:00; 4. Andrea Hewitt, NZL, 57:11; 5. Jodie Stimpson, GBR, 57:15. 11. Sarah-Anne Brault, Quebec City, 57:47; 37. Ellen Pennock, Calgary, 59:50. 1. Alistair Brownlee, GBR, 51:43; 2. Vincent Luis, FRA, 51:45; 3. Jonathan Brownlee, GBR, 51:48; 4. Javier Gomez, ESP, 52:00; 5. Dmitry Polyanskiy, RUS, 52:12. 31. Andrew Yorke, Caledon, Ont., 53:10.